Do You Tip a House Cleaner? Your mom may have cleaned up after you for free, but now that you’re on your own, you’ll have to handle those chores yourself or pay someone else to do the dirty work. Professional house cleaners charge by the hour or the job, and you may wonder if you also need to tip them. After all, they perform a personal service and are an important part of your life. However, unlike wait staff and bartenders, guidance for tipping of house cleaners falls into a gray area. Whether or not you tip your house cleaner is entirely up to you. You may wish to give a tip during special occasions or when the house is especially unclean. You’re already paying a fee for housecleaning. If you fail to tip, your housekeeper is unlikely to start sweeping dirt under the rug or ignoring the mold in the shower; if she did, you’d simply hire another cleaner. Tipping is not necessary, but some people like to tip to show appreciation. You might also include a tip if you’re a real slob or you leave the cleaner with a particularly nasty job, such as cleaning up after your shedding golden retriever. If you decide to tip your house cleaner, you can opt to tip each time the cleaner visits your home, once a month for regular cleaning service or once a year. If you elect to tip at each visit, $10 to $20 per visit is acceptable. Even if you don’t tip each time your house cleaner shows up, you may want to include a tip during the holidays. In this case, a tip is more of a thank you gift. You could also think of it as a holiday bonus for someone you employ. This tip can be as small as a few dollars or as large as a week’s pay, or the amount you’d pay for one visit. Instead of a cash, you could show appreciation to your house cleaner with a gift card or a present. This could range from baked goods to a hand-knitted scarf to a nice bottle of wine. If you know the cleaner well, tailor your gift to her personal taste: a box of chocolates for someone with a sweet tooth or tickets to a game for a sports fan. Along with your gift, include a hand-written note of appreciation. 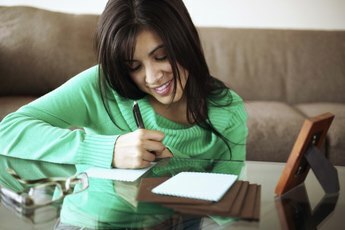 If you’re strapped for cash or stumped for gift ideas, write a thank-you note in lieu of a tip. A sincere note can be just as appreciated as cash. Tipping customs vary around the country. People tend to tip more in larger cities. You should tip more for someone with whom you have a long relationship. If the same woman has been cleaning up your messes for five years, you might want to spring for a significant year-end tip to show your appreciation. If you’re not sure what to tip, contact the agency or service that employs your house cleaner and ask what’s customary. Another option is to poll your friends to find out how they handle the situation. If none of these sources yields an acceptable answer, go with your gut. Tip what you can afford and be sure to say thank you. Care.com: Holiday tipping guide: Who Gets Gifts and How Much Should You Give? Should I Tip a House Painter? 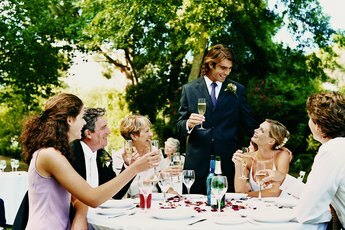 What Percentage of a Wedding Budget Goes to the Venue? How Much Do You Pay Preachers for Weddings? How Much to Tip a Hairdresser for the Holiday? How Much Should You Tip Your Childcare Provider?